Eastern Shipbuilding Group, Inc. announced the delivery of the M/V BRAVANTE VI (Hull 156) on Friday February 28, 2014 to Boldini S.A., BRAVANTE GROUP of Brazil. The BRAVANTE V (Hull 155), the first in the series, was delivered three months earlier and is currently on charter in Brazil. The BRAVANTE VI is the second STX SV290 design of five vessels in a series which are all, ABS Classed, AC Diesel-Electric powered, twin Z-drive propelled PSV’s measuring 284’(86.5m) x 60’(18.3m) x 24’-6”(7.5m). These high-tech vessels feature four Cummins QSK-60DM 16-cylinder turbo-charged IMO Tier II diesel generator engines each rated at 1,825 kW at 1,800 rpm. Cummins also furnished the four Marathon Model 744 690VAC main generators. 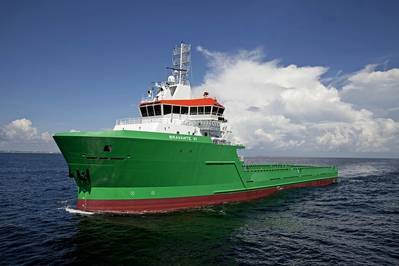 Main propulsion power is provided by two 690VAC electric motors driving two Schottel Combi-Drives SCD 2020 Single Fixed Pitch Propellers with Nozzles rated at 2,500 kW at 750 rpm each for a total of 6,700 Hp. Schottel also provides two STT 4 Fixed Pitch Reversing Tunnel Thrusters rated at 1,180 kW at 1,170 rpm, each with direct coupled Hyundai 690VAC electric motors. GE Energy provides the complete system integrated diesel electric package, including the thruster drives, motors, control systems, DP system, switchboards, motor control centers, automation and navigation/communication electronics. These vessels are capable of a maximum speed of over 13 knots with a cruising speed of 12 knots. The fully integrated bridge is arranged for increased visibility and features the latest technology in navigation, communication equipment. Firefighting Vessel: ABSFFV-1, 2x5284 GPM Monitors w/Deluge System Starting with the BRAVANTE VI and including the remaining three vessels, all will feature the added Class notation ABS FFV-1. All five vessels contracted are Marshall Islands Flag, IMO/SOLAS, ABS Classed A1, Offshore Support Vessel Ocean Service, Loadline, AMS, ACCU, Circle E, with additional ABS Class notations UWILD, ENVIRO, DPS-2. STX Canada Marine and Eastern Shipbuilding provided the design for these vessels from the very successful and proven Eastern Shipbuilding “Tiger Shark Class” Series. Ten other Offshore Supply Vessels in this series have been delivered to Eastern’s clients and have already proven themselves in worldwide operations.